The end of the year is always very busy, so we wanted to take one final look back at the last months of 2016. Many things changed in Firefox DevTools last year, particularly towards the end of the year. The effort to refactor some of our tools started to pay off and we landed some great re-designs that should make web developers’ lives easier. We shipped a brand new CSS Grid inspection tool, first of its kind (thank you gabrielluong, helenvholmes, and jensimmons). We also shipped a brand new, redesigned, console panel. It’s only enabled in Nightly for now, but it’s on track to be enabled everywhere very soon. A lot of work went into creating Reps, the reusable widgets responsible for displaying all kinds of output in the console. This is great because these reps are shareable components that we’ve already begun to use in many other DevTools. Thank you to a lot of people, especially contributor nicolaschevobbe, bgrins, Honza, linclark, and others. 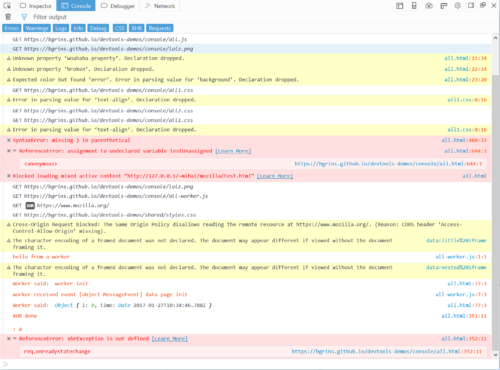 2016 was also the year we shipped our brand new debugger front-end! This was an accomplishment that we can be proud of, that sets the stage for more awesome tool releases in 2017. I’m personally really excited by the impact we’ve seen since moving this project to GitHub. The beginning of 2017 will be an interesting time for us to experiment with moving even more code to GitHub. I’m already confident that this is the right thing for us to do at this stage, and we have the debugger project to thank for this. Props go to jasonlaster, jlongster, clarkbw and the debugger github community that has been so great. As if that’s not enough to impress, we also shipped the new, completely redesigned RDM (responsive design mode) in November 2016. Not only do the responsive views look and work better, RDM also comes with major new features like network throttling and more. Thank you to jryans, zer0, gabrielluong. There is no XUL. Only Web. Great work bgrins, juliandescottes, tromey. The team even went as far as putting in place an npm-based local development workflow so you can build the inspector, open it in a browser tab, make changes and see them in the browser by simply reloading the page! Moving on to the network panel, thanks to the hard work of Honza, rickychien, steveck, gasolin and contributor jsnajdr, the panel has been almost entirely cleaned of its XUL markup and migrated to React! We now have a new and more modern code base that I’m sure will be very exciting for people to work with. Speaking of the end of XUL, tatumcreative eradicated a large piece of old code by re-writing the toolbox tabs using HTML and React. A lot of work went into fixing “paper-cut” bugs – you know, those little (or not so little) annoyances that make it frustrating to use our UI. A big thank you to ochameau for making the inspector a lot faster and more resilient and to mikeratcliffe for fixing many bugs of the inspector event tooltip. While I’m covering the inspector, let me mention some other noteworthy new features: css level 4 colors are now supported (thanks jerry and tromey), there are visual hints between closing and opening tags (thanks juliandescottes), text nodes are highlighted (juliandescottes again), and whitespaces in inline layouts are easy to debug (thanks to me ). Our tools have became a little bit better for RTL (right-to-left) users too, thanks to contributor tomer. Service worker’s statuses are now visible in about:debugging thanks to juliandescottes. The animation tooling can display easings thanks to daisuke and birtles. We’ve also written more React than ever before. I’m very happy that our UI is converging towards one common style. Thank you jlongster for showing us the way! mikeratcliffe did a ton of work on the storage inspector too, so it works even better with IndexedDB, is able to delete cookies, and more. In 2016 we also spent time planning for the future and in particular setting up for the new Performance Tool project. A lot of talking and design work happened. We are now confident that we’ll be able ship an awesome performance tool that Firefox and web developers will love to use. Thank you jimb, tatumcreative, ejpbruel, mstange. Thanks to all who contributed to making DevTools better in 2016. Thank you to all the contributors who helped fix DevTools bugs. I could not mention them all here unfortunately. Let’s have a great 2017 together! These are really great advancements! I still get complaints from my developers about the console not opening or opening empty sometimes with no visible nodes. The other sore spot seems to be no live editing of JS loaded in the page. Will the new debugger make it easier to do replay debugging? Can these types of changes now be introduced solely using the github project, without building Firefox from HG source? * Live JS editing: yeah I know, that’s a big missing piece. It’d definitely known and has been discussed many times, but is proving really hard to implement with our current architecture unfortunately. * Replay debugging: not yet, but record/replay is definitely in the works, and we might even get something in 2017! Stay tuned. It should be really easy to add, and we do have 2 submenus in our inspector context menu (copy and attributes) which we could use to add this new menu item. I will try to get this moving forward. * Network panel filters and Service Worker debugging: I can’t speak to these, but I’ll make sure the right people know about these. * Contributing to DevTools on GitHub: yes, completely doable for the debugger panel. None of the other panels are there yet though, but we are experimenting with this right now, and will have a plan for moving more of our tools to GitHub in a couple of months. * More recently, we landed a npm-based dev workflow for the inspector panel, so even though you still need to download the HG source, you can simply `npm install`, `npm start` within the inspector folder, and you’re all set to work on the inspector just like on any web app (F5 to reload in a browser tab, no build needed). Although that’s very experimental still. * I did make a mistake, I meant empty inspector panel, *NOT* console. * Replay debugger, live editing, and speed seem to be what most devs I talk to really find lacking in DevTools. * Service Worker has tickets for vague developer experience improvements (https://bugzilla.mozilla.org/show_bug.cgi?id=1209369), though IMHO it deserves own panel in the inspector, not relegation to about:debugging . Is it possible to move something as deep as SW into the devtools with inspector and console? or is this outside the scope of dev tools? About service works, moving some of the UI to devtools rather than inside about:debugging is definitely on the roadmap, although not planned in the coming quarters yet. This exists already, you can access the color picker from the Firefox hamburger menu, then submenu Developers, and then Eyedropper. This opens the tool on the current page and when you click, copies the color to your clipboard. Maybe something simlar to http://www.colorzilla.com/firefox/ ?? Thanks for continuous work on Developer Tools. Some time ago there was “ffdevtools.uservoice.com” to make suggestions for future developments but now… how can we ask for new features? Thanks! Unfortunately the uservoice channel had to be closed. It had ended up only receiving spam at some stage. Amazing work so far, congrats to everyone involved! Additionally, is there any plans to migrate from React to Web Components in the future now that the v1 spec has finally started to land? Dropping XUL isn’t just a DevTools thing, it’s something Mozilla is going on a larger basis. The main point being that XUL is a non-standard technology that the rest of the web dev community is not using, and it forces us to maintain 2 rendering stacks in the same engine. As for adopting React, we don’t have a specific document that goes through the key points. It has been a slow experimentation process instead (and a fairly undocumented one unfortunately). What developers need is Firebug capabilities, ASAP. Without Firebug and FirePHP, we lost the ability to debug the back-end. Please, do the basic stuff first! Thank you Vanco for your feedback. Fortunately, these are known things that we can and will work on. Firebug capabilities: we have been tracking them in this bug: https://bugzilla.mozilla.org/show_bug.cgi?id=991806 trying to address the most requested ones step by step. There’s of course more, but hopefully they should all be there in the bug and it’s just a matter of getting to them. Box-model not interactive: I am not sure what you mean by that. The box-model widget that you can find in the Computed tab does allow to change margin, border, padding, by clicking on the boxes. Maybe this is something else. I’m sorry you are unsatisfied, and thank you for using Firefox as your primary development browser. Nice! Good Job. Changes from xul to JS and the github project are welcome. Thanks for the very detailed update. I am very impressed to see the direction chosen was for main stream and standard usage. 1: Mimic Firebug and move it next to the Rules, Computed, Animations and Fonts panels on the right of the Inspector. 2. Mimic Firebug and auto update the DOM properties that are displayed when an element is selected in the Inspector. We shouldn’t have to click “Show DOM properties” each time we select a new element, just like we don’t have to click a “Show CSS rules” for CSS rules panel to display the currently selected element’s CSS rules. Given how all the tools seem to become slower and lose functionality when transforming to HTML (was felt very deeply with debugger, but also others like inspector and web console), I get more appetite to check out if other browser have tools with more speed and features – even though I deeply and dearly love Mozilla and Firefox. That said, it there work going on for re-gaining performance and features (like ability to select which kind of JS/CSS messages you want in web console, or esp. the mouse-over variable inspector that was a killer feature in the old debugger)? Thanks for the feedback Robert. We definitely are working on improving performance of the tools. A bunch of work has been done in the inspector panel, and more is coming soon. The console and debugger are, for now, held on pre-release channels, and part of the things we want to fix before we enable them everywhere is performance. In terms of missing features: same here, we want to make sure the console and debugger are at feature-parity with the older versions before turning them on everywhere. I love the keyboard accessibility, there is no universal all-the-time-keyboard or all-the-time-mouse answer, it’s subjective to the given situation which device is faster to interface with. Also after spending five days to mostly get my new Firefox theme under control I noticed that all of the “native themes” are actually melted in to the code directly **INSTEAD** of added as addon themes. All those “native looking” themes and **ALL** of the extensions should be listed as addons otherwise the purpose of having addon support is pretty much negated. Lastly I’d like to have a direct button for opening Developer tools (especially the Console) instead of having to two-click the Developer drop-down button/menu. That should be implemented as part of the Web Developer extension though so non-developer users won’t see those buttons. Besides that I’ve noticed a considerable improvement in performance and general usability over Firebug. Thanks to all involved for their hard work! The annoying console/debugger bug you mentioned is most probably related to our source-map support, which we are fixing right now. The work is tracked in this bug: https://bugzilla.mozilla.org/show_bug.cgi?id=1339970 and we have someone working on this now. So hopefully this should get much better soon.